Last month, Nike organized a free basketball clinic for Chicago area youth held at the Quest Athletics Center. Nike collaborated with former Chicago Bulls “ball boy” Darren Hammond, president and CEO of The Darren Group which works towards inspiring youth to realize their potential through basketball. 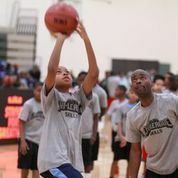 “The event was a success, anytime I can help get kids active, teach them the fundamental skills of basketball, including good sportsmanship and the importance of living a healthy lifestyle while also keeping kids off the streets and saving a life, my job was not in vain,” Darren Hammond said. Hundreds of students participated in the clinic taught by Nike’s basketball experts, offering skills training and advice on good sportsmanship and behavior. Chicagoan and Farragut Academy All American Ronnie Field shared basketball knowledge and guidance on how to pursue athletic goals. Students in the basketball clinic also received a lunch, a Nike t-shirt, hat, basketball and other gifts. 28th Ward Alderman Jason Ervin, Commissioner of Water Reclamation District of Chicago, Patricia Horton, National Action Network President, Chicago Chapter, Maureen Forte, Blackstar Project founder Phillip Jackson, Mt. Vernon Baptist Church Pastor Rev. Johnnie Miller and Greater St. John Bible Church Pastor Rev. Ira Acree are among the many that came out to support the Darren Group and the basketball clinic in the community. © 1500 Chicago Hispanic Newspaper, Lawndale News, Hispanic Bilingual Newspapers, Su Noticiero Bilingue. All rights reserved. XHTML / CSS Valid.